If you’ve accumulated credit card debt and want some extra time to pay it down without racking up interest charges, the BankAmericard credit card offers a lengthy introductory balance transfer offer and decent ongoing APR. On the downside, you won’t earn any rewards while you chip away at your balance. One of the biggest perks of the BankAmericard credit card is its long balance transfer offer – including a 0 percent intro APR for the first 18 billing cycles (15.24-25.24 percent variable APR thereafter) as long as you make your transfer in the first 60 days. This is a relatively long intro period, since many balance transfer cards only include 12 months with a 0 percent APR. For cardholders looking to pay down debt and boost their credit score, this is a huge perk. Just keep in mind that you’ll have to pay a 3 percent fee on the balance you transfer. If you have a larger debt, this can add up to quite a bit. As you can see, the balance transfer fee might be costly, but it still saves you quite a bit when compared to the interest charges you’d have to pay over the same amount of time. To see how much you’ll actually save, you can input your current balance and interest rate into CreditCards.com’s balance transfer calculator. 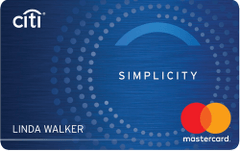 However, some balance transfer cards – like the Chase Slate – don’t charge a balance transfer fee and might be a better option for many cardholders. You’ll still get a lengthy intro period to chip away at your debt without racking up any extra charges. The Chase Slate intro period is slightly shorter (0 percent for the first 15 months and 16.99-25.74 percent variable APR thereafter), but you’ll save enough money from the balance transfer fee to make up for the interest you’ll pay in the extra three months. Tip: If you are a small business owner, a personal balance transfer card can still be a good option for paying down business debt. You’ll just need to weigh the effects on your personal credit score against potential savings. If you decide the BankAmericard is best for you, transferring a balance to the card is relatively simple. You’ll need to make sure you transfer your balance in the first 60 days to qualify for the offer. It is also worth noting that you can’t transfer a balance from another Bank of America card, so if you are carrying debt on a card from the issuer, you’ll have to choose another offer. Qualifying for a balance transfer is a bit different than qualifying for your card application – and you might not be eligible to transfer if your debt-to-income ratio is too high. If you do qualify, be sure to continue making payments on your old card until the transfer is processed, which can take up to 14 days. When you transfer a balance to a balance transfer card, you’ll only be able to transfer as much as your credit limit on the new card. If your credit limit is not high enough to transfer your whole balance, you might end up having to make more than one balance transfer – which can be detrimental to your credit. In addition to a lengthy interest-free period on balance transfers, the BankAmericard offers a 0 percent APR on new purchases for the first 18 billing cycles (15.24-25.24 percent variable APR thereafter). For cardholders eager to finance a new purchase interest free, this is a nice perk. If you are paying down debt but have a large purchase coming up that you don’t want to compound interest, choosing a card with an intro APR for both balance transfers and new purchases can be a great strategy. But keep in mind that intro APRs come with stipulations, so you shouldn’t take on any more than you can pay off. If you miss a payment, for example, most banks reserve the right to end your intro APR offer. Tip: Financing a large purchase with a card with a generous intro APR can be particularly beneficial for students. More expensive purchases like textbooks or technology can be paid off over time without racking up interest charges. Just make sure you can afford to pay off the entire balance in the intro period to avoid hefty interest when the offer ends. After the introductory APR on balance transfers and new purchases ends, the BankAmericard includes an ongoing APR of 15.24 percent to 25.24 percent (variable). If you qualify for the low end of the range, this is a pretty decent APR in the long run. However, the high end of the range is pretty steep – making it easy to accumulate interest if you don’t pay your bill in full each month. If you do plan on carrying a balance after the introductory period, you might be better off with a lower-APR card. The KeyBank Latitude Mastercard, for example, offers a shorter intro APR period than the BankAmericard but a much lower ongoing APR. On the plus side, the BankAmericard does not charge a penalty APR if you make a late payment. However, you’ll have to pay a late fee of up to $39 (up to $28 for returned payments). 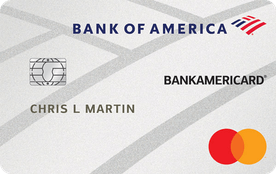 Unfortunately, the BankAmericard does not include any sort of rewards program. If racking up rewards is a long-term priority, there are several balance transfer cards that do include rewards. The Discover it® Balance Transfer card offers 5 percent cash back in select rotating categories (up to $1,500 in purchases after you enroll, then 1 percent cash back). The tradeoff with the Discover it card is a much shorter introductory period for new purchases – as is the case with many balance transfer cards that include rewards programs. While you can look forward to rewards after paying off your balance, it might be more difficult or expensive to pay it off beforehand. Since you have the potential to earn rewards, you also might be more tempted to spend a bit more on the card, which adds to the balance you must pay off. If paying off debt is your main focus, you may be better off skipping a rewards program for a card that allows you to curb your debt faster. Even though the BankAmericard doesn’t come with a rewards program, it does qualify for participation in BankAmeriDeals – Bank of America’s card-linked offer program. This allows cardholders to earn cash back from hundreds of merchants just for linking a deal and shopping with their BankAmericard. Though the BankAmericard is a barebones card that is light on features, it does include several features designed to help cardholders manage debt and improve their credit. Monthly FICO score for free– As you pay down your balance and improve your credit utilization, you can keep track of changes to your credit score with a free monthly report. Access to credit education – In addition to features that help you decrease your debt, the BankAmericard gives users access to credit education on topics like budgeting. Online shopping security features – To improve security when shopping online, the ShopSafe® service provides a temporary card number to protect your account information. Overdraft protection – If you link an eligible Bank of America checking account to your credit card, Bank of America can automatically transfer money ($100 increments) to your checking account to prevent overdrafts. Just keep in mind that you’ll be charged a cash advance APR if you choose this option. $0 fraud liability – If there are fraudulent transactions on your account, this feature ensures that you are not responsible for covering those charges. Text banking – To make it easier you access account information, you can request info by text message. Bank of America’s customer service reputation is decent, but not the best of all issuers. The bank scored 791 on J.D. Power’s 2018 customer satisfaction survey, ranking seventh out of 11 major banks. The Bank of America mobile app gets pretty good reviews – rating 4.5 out of 5 on the Google Play Sore and 4.6 out of 5 on the Apple App Store. Who can qualify for the BankAmericard? The BankAmericard is designed for users with good credit (above 670) – making it a bit more difficult to qualify for the card. However, Bank of America does let users see if they pre-qualify for any offers without a hard pull on your credit. How does the BankAmericard compare to other cards? If you are ready to start chipping away at your debt, the BankAmericard is a good option. It has one of the longer intro periods you can find among balance transfer cards and an average APR. However, a few other cards offer perks that might make them more valuable for some users – including no balance transfer fee, a rewards program or an even longer intro period. The Chase Slate card has a slightly shorter introductory period than the BankAmericard, but it makes up for this with a $0 balance transfer fee for the first 60 days. On large balances, this could potentially save hundreds of dollars. In most cases, you’ll save more from the balance transfer fee than you’ll pay in interest in the extra three months. However, the Chase Slate does come with a higher ongoing APR. If you foresee needing to carry a balance after the introductory period, it might not be the best option. Unlike many balance transfer credit cards, the Discover it Balance Transfer includes a rewards program – and a decent one at that. Cardholders can enroll each quarter to earn 5 percent cash back in rotating bonus categories (up to $1,500, then 1 percent). Users also earn 1 percent cash back on general purchases. While the introductory period for new purchases is not as long as the BankAmericard, the Discover it Balance Transfer is a good choice for users looking for long-term value on their card – after they pay down a balance. The Citi Simplicity offers one of the longest introductory APR periods on balance transfers available, making it seem like an incredibly valuable offer. However, its high balance transfer fee means it comes at a price – especially for cardholders who need to transfer a larger balance. If you need to transfer $3,000 to the Citi Simplicity, you’ll be charged $150 to do so. On the plus side, the Citi Simplicity never charges a late payment, making it a good option for cardholders who occasionally make their payments past the due date. Who should get the BankAmericard credit card? Cardholders with a large balance who want 18 billing periods to pay it off interest free. Cardholders looking for a relatively low regular APR. Users who are more focused on paying down a credit card balance than earning rewards. Cardholders who need to finance a large purchase over 18 billing cycles without incurring additional interest. Transfer a balance in the first 60 days of membership to qualify for the card’s 0-percent interest rate on balance transfers. Pay down your balance before the introductory APR ends to avoid interest. Avoid charging new purchases you can’t pay off in addition to your balance transfer. Take advantage of BankAmeriDeals to earn cash back on everyday shopping. Use your free monthly FICO score and credit education resources to monitor and boost your credit score. Is the BankAmericard credit card worth it? While the balance transfer fee on the BankAmericard makes it less competitive than some balance transfer cards, its decent ongoing APR and lengthy introductory period still rank it as a great option for paying down debt. Plus, cardholders can take advantage of BankAmeriDeals to earn some extra cash back – even though the card doesn’t include a rewards program.